Today, HTC seems to be delivering on their promise for a stronger focus on the 150-300 USD market segment by launching the Desire 816, a phablet with a 5.5" 720p display and a Snapdragon 400, along with dual front facing speakers with an amplifier on each speaker. 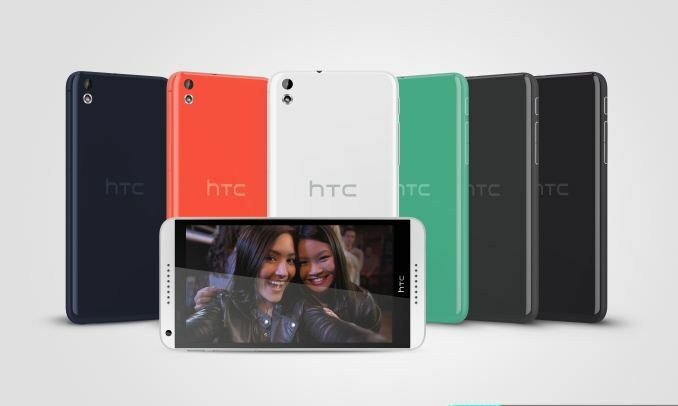 For now, it seems that HTC is quite tight-lipped on software, as they only state that the 816 runs "Android with HTC Sense", although based upon the press images it's clear that the hardware buttons have been removed and it may be the beginning of a trend for HTC's 2014 devices. While many are likely to object over the bezel on the bottom, it seems that this may be an unavoidable bezel, as the One, One max, LG G2, Nexus 5, and other phones all have the glass bezel area around as tall as the one that looks to be on the Desire 816. Based on the photos that I've seen for the HTC One's digitizer, it seems that the area must be used for digitizer connectors, but capacitive buttons will fit in that area. Overall, outside of pricing, there's not too much to talk about. It does use a NanoSIM, something that's definitely important to keep in mind for prospective buyers, and the 9.88 WHr battery is a bit small for the 5.5" form factor but based upon the performance of the One max with a 5.9" display, it shouldn't be too big of a deal, especially with the power-sipping Cortex A7s. The press release doesn't say anything about the LCD panel, but I guess that will have to be discovered at the press event. Overall though, this seems like a relatively well-designed phablet. Whether HTC's strategy will work is another question. I don't see how HTC can survive in the low margin business that is non-samsung android. what difference between msm8x26 and msm8x28?